In a medium pan over medium heat, melt 1 tablespoon of butter and sauté onion until translucent. Add tuna and stir, flaking the tuna in small pieces for 3 minutes. In a small saucepan, heat milk until a low simmer. Remove from heat. Grease four 1 1/2 cup ramekins with 2 tablespoons butter and sprinkle the inside of each dish with crumbled cotija. Place in the refrigerator to chill. In a large skillet over medium heat, melt 3 tablespoons butter and whisk in flour rapidly. When fully combined, add milk, continue to whisk. Stir until ingredients have thickened and are smooth. In a separate bowl, combine water and cornstarch and stir into simmering flour mixture. Add mustard, soy sauce and salt and pepper to taste. Rapidly whisk in egg yolks to simmering mixture. Cook for 5 minutes. Remove from heat and transfer mixture into a large mixing bowl. Stir in tuna mixture into the mixing bowl. Set aside. Add Gruyere cubes into tuna mixture, stirring and evenly distributing. Add half of beaten egg whites stirring and evenly distributing. Carefully add the remaining egg whites by folding in with a large spoon. Fill ramekins with mixture, leaving 1/2 inch space from top of each dish. 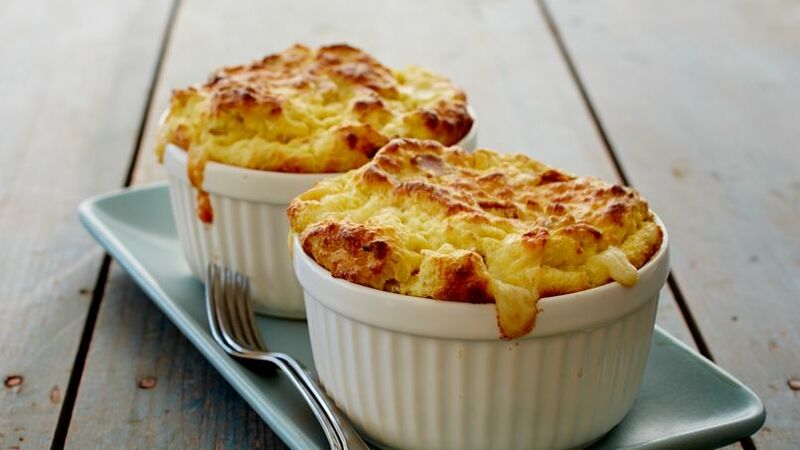 Place filled ramekins on a baking sheet and bake for 20 minutes or until puffed and golden. Serve immediately. Add chopped tomatoes and broccoli for a veggie packed version.